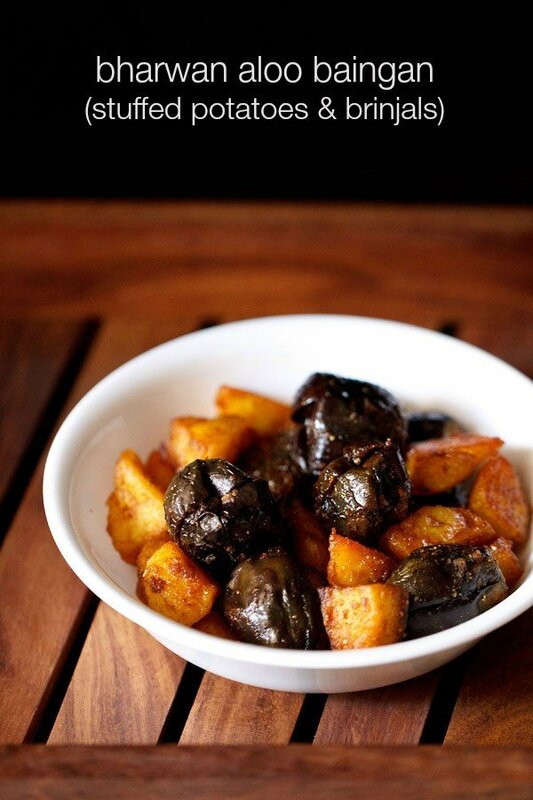 bharwan baingan are small brinjals stuffed with a spice mix and sauteed with potatoes. 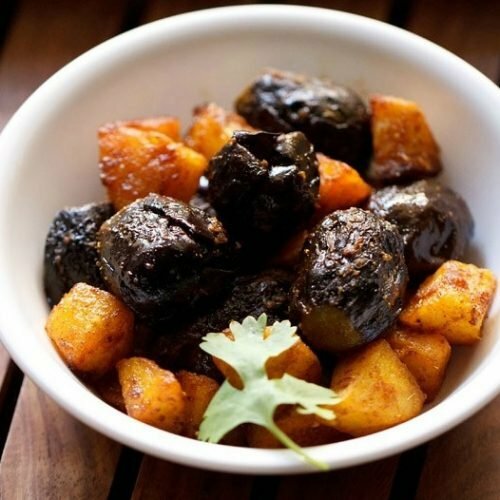 bharwa baingan recipe with step by step photos – one easy and tasty recipe of bharwa baingan or stuffed brinjals with potatoes. 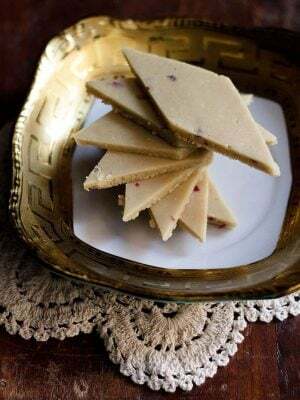 this punjabi bharwan baingan is a family recipe. here the baingan is stuffed with a spice powder mix and not any veggies. 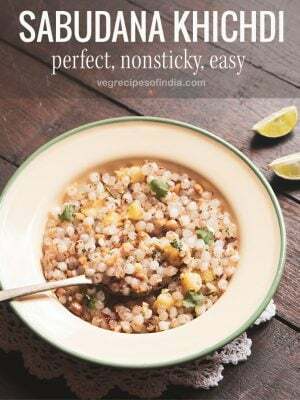 its the spice blend which gives the dish its taste and flavor. the recipe is also made without onions and garlic. so its just the spices, brinjals and potatoes. simple but flavorful. 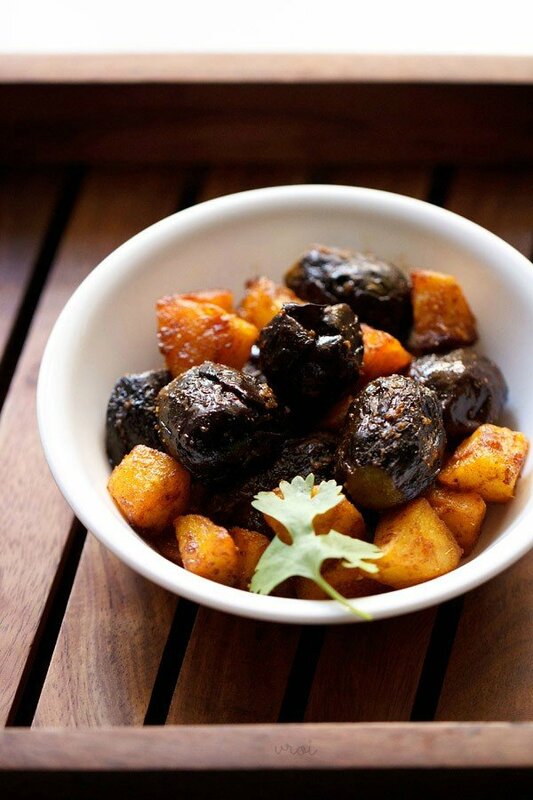 eggplant also known as brinjal in india and baingan in hindi is a favorite veggie at home. we like it in all forms fried, stuffed, mashed. there is a very popular recipe in india of mashed spiced eggplant known as baingan bharta. 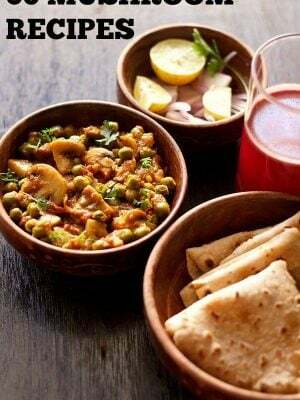 there are many variations of this popular dish and i have already shared punjabi baingan bharta and maharashtrian vangyache bharit. there are different varieties of baingan/eggplant that we get. you can use the small baingan or the medium ones. 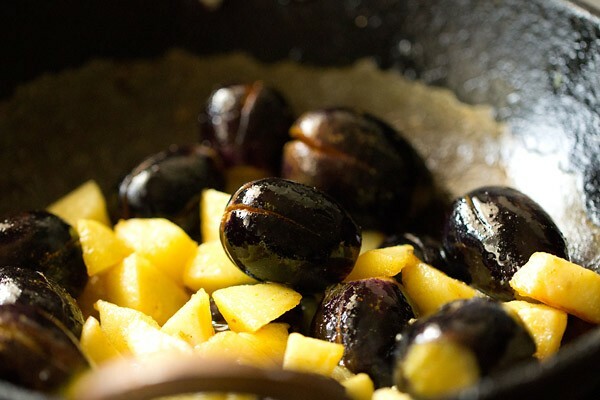 i have used small purple baingan for this recipe. you could use the green or white ones too. i have added normal potatoes but you can add baby potatoes too. addition of potatoes in this dish is optional. but i would suggest to add the potatoes as they taste good and add lot of flavors. even if someone in your family don’t like the brinjal then they can at least have the potatoes. at my home we always add potatoes in this recipe. 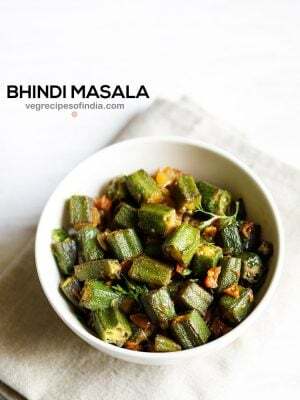 you can serve the bharwa baingan with chapatis or phulkas or bread or plain paratha. 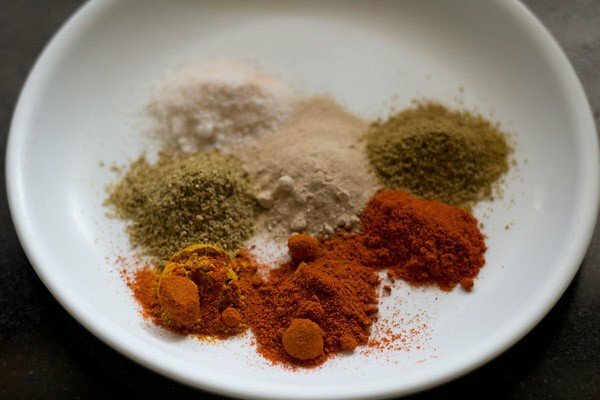 firstly, mix all the six spice powders along with salt – garam masala powder, chilli powder, turmeric powder, coriander powder, cumin powder and amchur (dried mango) powder and salt. keep aside. rinse the baingan or brinjals and dry them with the kitchen towel. 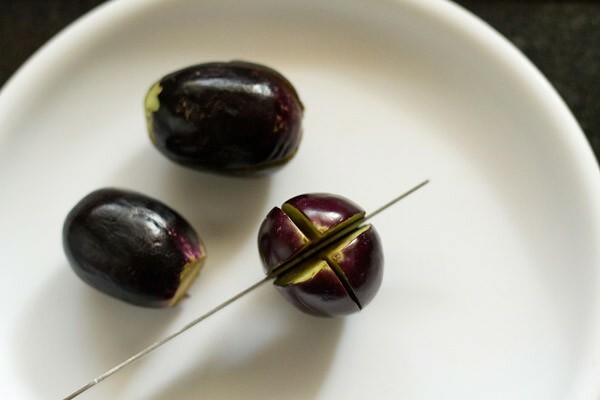 slice off the stem from the brinjals. slit each baingan into 4 parts taking care that you don’t cut the entire baingan. stuff the baingan with the spice powder mixture evenly. keep all the stuffed baingan aside. peel and dice the potatoes. 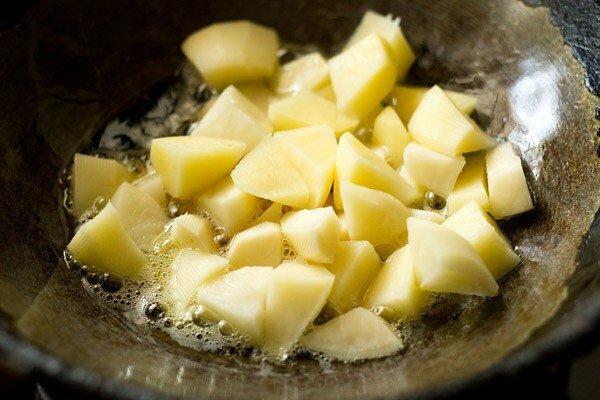 if using baby potatoes then chop if they are medium sized. If they are small, then just keep them whole with or with the peel. in a wok or kadai or heavy bottomed pan. add the oil. then add the chopped potatoes. saute the potatoes till they change colour and get lightly browned from the edges. add the bharwa baingan, stir and saute the baingan for a minute. then cover the pan and cook the stuffed baingan on a low flame. check a couple of times and stir the veggies. cover and then continue to cook. 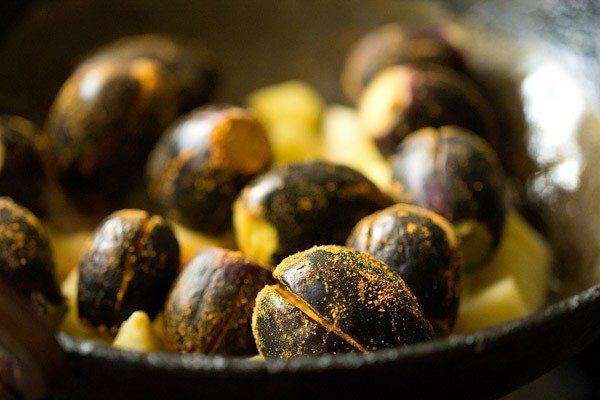 once the stuffed baingan are cooked and softened, add the remaining spice powder mix. stir well and saute for a minute. check the taste and add more salt if required. 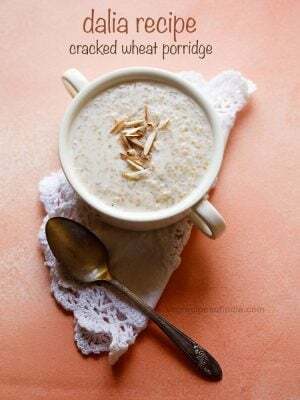 serve bharwa baingan hot with phulkas or plain paratha. 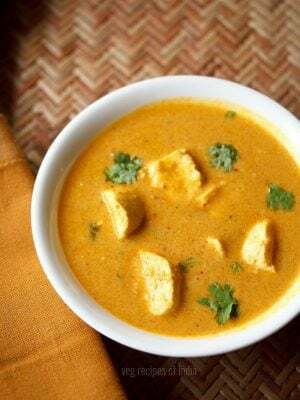 1. first take all the spice powders in a small plate or bowl – ½ tsp turmeric powder, 1 tsp garam masala powder, 1 tsp red chili powder, 1 tsp coriander powder, 1 tsp cumin powder,1 tsp dry mango powder and 1 tsp salt. 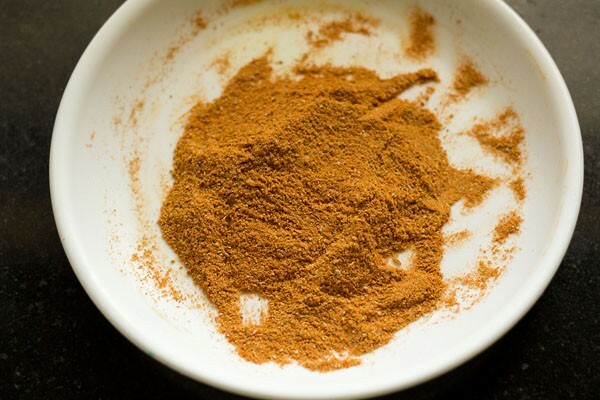 2. mix the spice powders & salt very well with a spoon. keep aside. 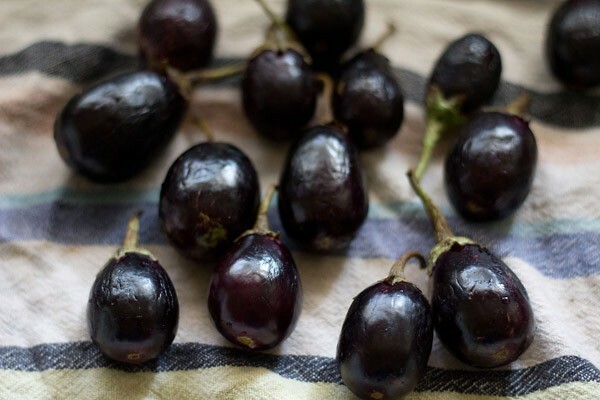 3. rinse and wipe dry the brinjals. 4. slit each brinjals four ways, from the base or top keeping a few centimeters gap. so that the brinjals stay whole and are not completely chopped through. 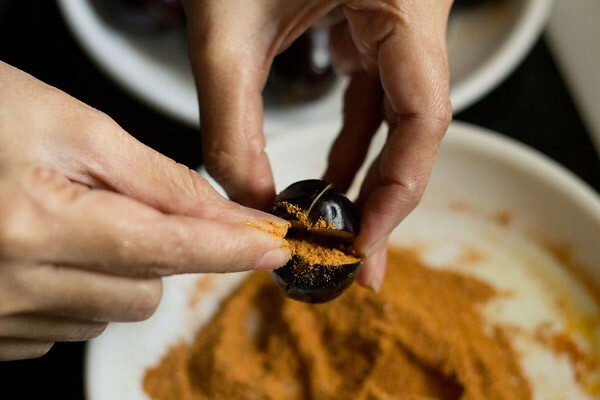 5. now stuff the mixed spice powder or masala in the brinjal very well. some of the masala powder will remain and we will add it right at the end in the dish. 6. stuff all the brinjals this way. keep aside. 7. in a kadai or pan, heat 2 tbsp oil. add diced potatoes. 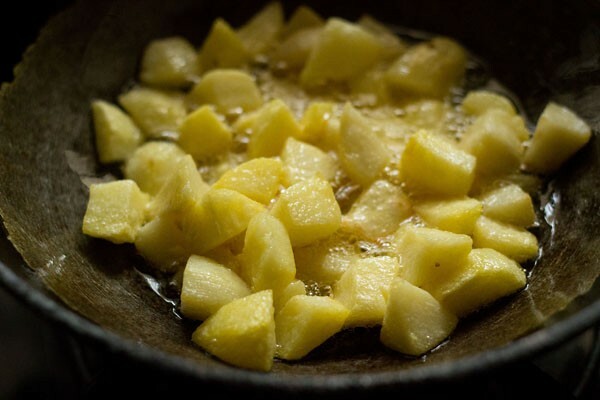 8. on a low to medium flame, saute the potatoes, stirring occasionally. 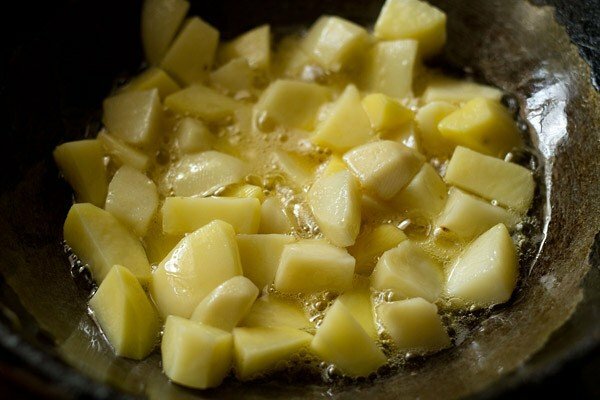 9. saute till the potatoes have lightly browned from the edges. 10. now add the stuffed baingan. 11. stir well and saute the baingan for a minute. then cover the pan and allow the stuffed baingan to cook on a low flame. no need to add water while cooking the baingan. 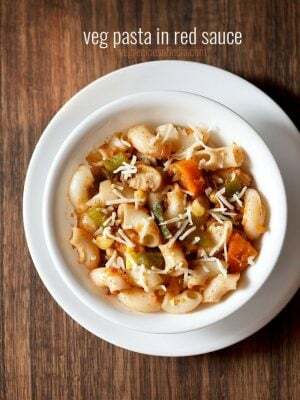 12. after 4 to 5 minutes, remove the lid and stir the veggies again. cover and allow to cook again. you will have to check once or twice to see if the bharwa baingan have softened or not. 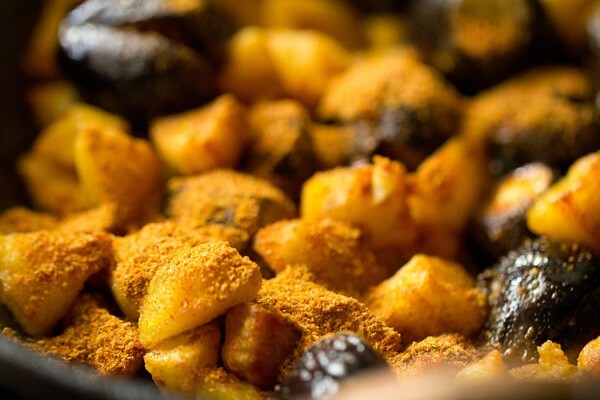 13. once the stuffed baingan are softened, add the remaining leftover spice powder mix on top. stir and saute for two minutes. here you can also add more salt as per your taste. 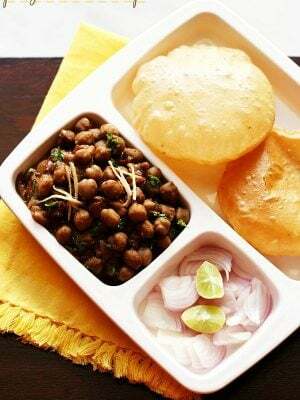 14. serve the bharwa baingan with chapatis or phulkas. the bharwan baingan also tastes good with bread. 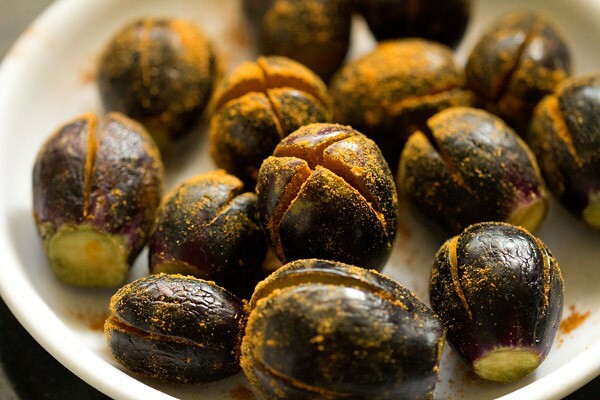 you can also garnish these stuffed baingan with coriander leaves. thanks nisha. if you would have cooked it more, then the slight rawness at the end of the brinjal would have been not felt. Really thanks a tonnnnnn….. M a new learner regarding cooking as spent most of my time in hostel. I recently have started cooking for my husband. I go thru ur recepies n go for one. He is happy 🙂 making my day. welcome himani. good to know this. Hi Dassana …I wish to thank you from the core of my heart… I think my duty every evening while I travel is to check your recipes and find my pick for my evening dinner….being recently married I never bothered under my mum’s shelter to know anything about cooking…but discovering your website has just made things so much easier in my life..!! Thanks to you for making this possible for me…:-):-)..
P.S: this is my pick for today!!! welcome diana. thanks for sharing such a sweet feedback. good to know that you check recipes everyday from the blog. reading your comment made me feel good. please feel free to ask any query on recipes posted. happy cooking. thanks tina. do try the other punjabi recipes as well. Hello, this is a very nice recipe. However, for those who are not Indian, we might get a little confused at the end. When you say to let it simmer, how much water should we add? Is this a watery dish or drier dish? this is a dry recipe. water is not added to this recipe. when i say simmer i mean letting the vegetables cook in their own juices. 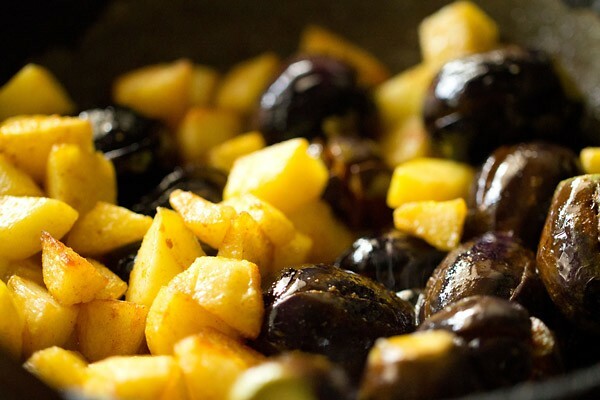 generally we do not cover the pan and let the aubergines and potatoes cook in their own juices. however if you want the veggies to cook quickly you can cover the pan and let the vegtables cook. Thanks Suhas. The other stuffed goan style recipe takes some time. I hope this recipe came out good.